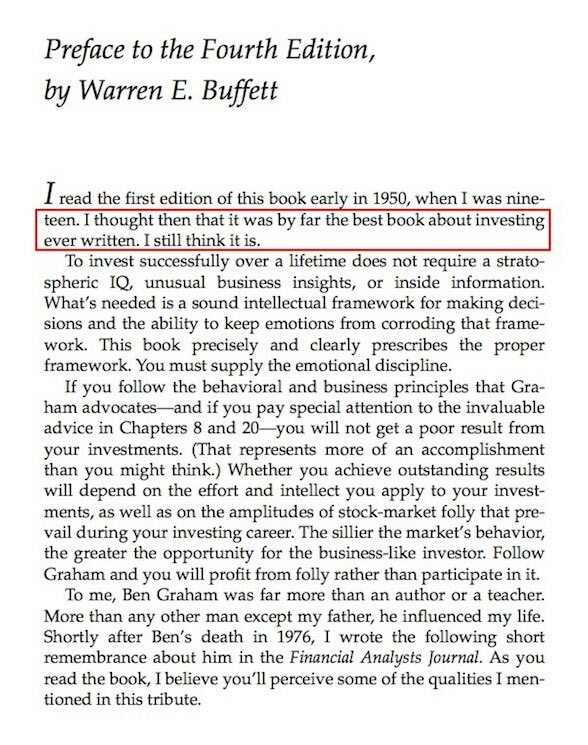 "By far the best book about investing ever written... To invest successfully over a lifetime does not require a stratospheric IQ, unusual business insights, or inside information. What’s needed is a sound intellectual framework for making decisions and the ability to keep emotions from corroding that framework. This book precisely and clearly prescribes the proper framework." Graham recommended three categories of stocks, with different qualitative and quantitative specifications for each category. Criterion #1 works out to $500 million today, based on the difference in CPI — or Inflation — from 1971. Graham recommended a minimum portfolio size of 10 for Defensive grade stocks; or in other words, not more than 10% of one's portfolio per Defensive grade stock. Benjamin Graham, Chapter 15: Stock Selection for the Enterprising Investor, The Intelligent Investor . As these criteria were written in 1971, Serenity compares last year's earnings to that of 4 years ago for criterion #4. Serenity recommends a minimum portfolio size of 20 for Enterprising grade stocks; or in other words, not more than 5% of one's portfolio per Enterprising grade stock. Graham's most well known category of stocks also included criteria for earnings and diversification. 1. A diversified group of common stocks at a price less than the applicable net current assets alone — after deducting all prior claims, and counting as zero the fixed and other assets. 2. Eliminated those which had reported net losses in the last 12-month period. Graham recommended a portfolio size of 30 for NCAV grade stocks; or in other words, not more than 3.3% of one's portfolio per NCAV grade stock. Serenity applies all seventeen of the above Graham criteria to all stocks, giving the following four results. The Intrinsic Value for each Graham Grade is calculated as follows. The Intrinsic Value is calculated from the quantitative criteria (#6 and #7) for Defensive investment, and is popularly known as the Graham Number. Note: Graham Numbers on Serenity are calculated using the average EPS of the past three years, as Graham required. Graham's quantitative criteria for Enterprising investment are the lower of 120% of net tangible assets, or a P/E ratio of 10. With a derivation similar to the Graham Number, we get the following Intrinsic Value calculation. Graham recommended the applicable net current assets alone, deducting all prior claims, and counting as zero the fixed and other assets. The corresponding Intrinsic Value calculation is popularly known as Net Current Asset Value or NCAV. Note: Serenity does not use the misunderstood Benjamin Graham Formula to calculate intrinsic values. Every stock is assigned a Graham Grade as follows. The stock meets the qualitative criteria for Defensive investment (#1 to #5), and has a positive Defensive Price (Graham Number). Classic Screener - Defensive Free! The stock is not Defensive but meets the qualitative criteria for Enterprising investment (#1 to #4), and has a positive Enterprising Price (Serenity Number). Classic Screener - Enterprising Free! The stock meets neither Defensive nor Enterprising criteria, but has a positive trailing 12 months (TTM) EPS and a positive NCAV Price (Net Current Asset Value / Net-Net). Classic Screener - NCAV Free! Intrinsic Value ÷ Previous Close, expressed as a percentage. An Intrinsic Value(%) of 100% or more indicates that the stock's Intrinsic Value exceeds its price. Graham Grade, Intrinsic Value and Intrinsic Value(%) — in combination — give a complete Graham assessment for a stock. Note: Defensive and Enterprising grade stocks require an Intrinsic Value(%) of 70% at current bond yields. Each stock is additionally given the following Graham Ratings that can be used for customized filtering and stock selection. The ratings are defined such that Graham's Defensive requirements default to 100%. For reference, the minimum ratings required for each of Graham's grades are given below. Requires a positive TTM EPS, the sole data point that's not annual. 200% ⇒ 66% growth etc; years 0, 1, 2 and 9, 10, 11 used. The Trailing Annual EPS has to be more than that of 4 years ago. Graham Number ÷ Previous Close, similar to Intrinsic Value(%). 70% when adjusted for today's bond yields. Calculated using Trailing Annual EPS and Tangible Assets instead. NCAV Price ÷ Previous Close, similar to Intrinsic Value(%). Optional rating for Public-Utilities and Financial Enterprises. All stocks in 61 Exchanges across 40 Countries covered.